Over 4000 potatoes of 27 different species constitute this monumental installation by Jeanne van Heeswijk. The potatoes are suspended in a room, representing the people and organisations involved in her projects between 1993 and 2012. Using a legend and an accompanying map, designed by Maurits de Bruijn, the underlying relations are charted. Van Heeswijk started from 3 parameters: the duration of the projects, the types of people involved (Typologies) and the different contributions those groups of people made (Capacities). The Typologies vary from artists and designers to scientists, educators, sponsors, technicians and the audience. The Capacities consist of visual arts, designs, text, image, financial or emotional contributions. 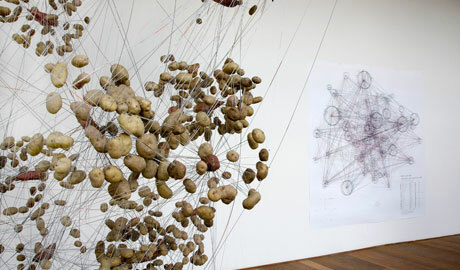 The potatoes are a metaphor for van Heeswijk’s network. On the one hand, potato species stand for certain qualities and have accompanying names: Eigenheimers represent the artists, Bintjes the educators. On the other hand, she chose potatoes because they gradually sprout under the influence of air and humidity, and their roots create a network of their own. Jeanne van Heeswijk’s projects are characterized by social involvement. She wants to create new public meeting spaces and stimulate cultural production. 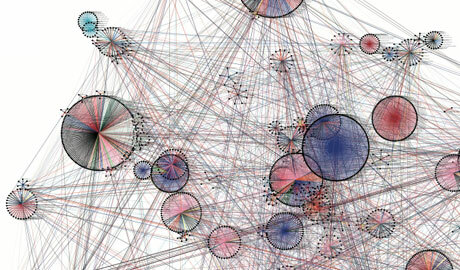 Works, Typologies and Capacities 1993-2012 is a way of thinking about how her work develops and the network it generates. Concept by Jeanne van Heeswijk. Map generated by Maurits de Bruijn [www.mauritsdebruijn.nl]. 3D potato model realized by Ritse Mol, Annet van Otterloo, Walter Thomson, STUK. Potato's provided by Agrico, Averis, HZPZ Holland, KWS Potato, Landjuweel, C. Meijer, De Nijs, Rungis, Schaap Holland, Stet Holland, TPC.